This article is about the Star Trek ship name. For the NASA design proposal, see IXS Enterprise. For the TV series, see Star Trek: Enterprise. Enterprise or USS Enterprise (often referred to as the "Starship Enterprise") is the name of several fictional spacecraft, some of which are the main craft and setting for various television series and films in the Star Trek science fiction franchise. The most notable were Captain James T. Kirk's USS Enterprise (NCC-1701) from the original 1960s television series, and Captain Jean-Luc Picard's USS Enterprise (NCC-1701-D) from Star Trek: The Next Generation. Two spacecraft with the name Enterprise predate the United Federation of Planets in Star Trek's fictional timeline. This USS Enterprise (XCV 330) appears in Star Trek: The Motion Picture (1979) among a series of illustrations depicting ships named Enterprise. It also appears as a model in Star Trek Into Darkness (2013), together with models of a Wright Flyer, a V-2 rocket, a Bell X-1, a Vostok-3KA capsule, a Space Shuttle orbiter, and some Star Trek universe starships. The 1979 Star Trek Spaceflight Chronology describes this "first interstellar liner" as a Declaration-class ship launched in 2123. Its length is given as 300 metres (980 ft), and it has a capacity of 100 crew and 850 passengers. The Star Trek Maps by New Eye Photography Editors, also published in 1979, listed this ship as a fusion drive probe that was Earth's first attempt to explore another star system. The Making of Star Trek: The Motion Picture, published in 1980, describes the ship as "the very first starship U.S.S. Enterprise". A painting of this ship hangs on the wall of Earth's 602 Club in flashbacks that appeared in the Star Trek: Enterprise episode "First Flight" (2003). United Earth Starfleet's Enterprise is the main setting of Star Trek: Enterprise (2001–2005). Enterprise was the first Earth built starship capable of reaching Warp 5. She was commanded by Captain Jonathan Archer and played an instrumental role in the founding of several proto-Federation alliances. Enterprise had significant engagements with the Klingons, Suliban, Xindi and the Romulans and playing a central role in the "Temporal Cold War." It is also featured as a model in Star Trek Into Darkness. Captains: Robert April (James Doohan [voice]), Christopher Pike (Jeffrey Hunter, Sean Kenney, Anson Mount), James T. Kirk (William Shatner), Willard Decker (Stephen Collins), Spock (Leonard Nimoy). The Federation's first Enterprise is the main setting of the original Star Trek series (1966–1969) and The Animated Series (1973–74). Having undergone an extensive rebuilding and refitting, Enterprise then appears in Star Trek: The Motion Picture (1979) and Star Trek II: The Wrath of Khan (1982), before being destroyed in Star Trek III: The Search for Spock (1984). The bridge appears on the holodeck of the Enterprise-D in the Next Generation episode "Relics". 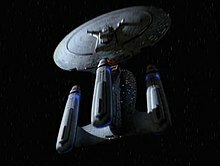 The ship also appears in the Deep Space Nine episode "Trials and Tribble-ations", and in the closing montage of the final Enterprise episode "These Are the Voyages...". Details of the ship's appearance differed prior to the time period of the original series, including a transparent dome ceiling for the bridge that appeared in the 1965 pilot episode "The Cage", as shown in a flashback to Captain Pike's command in "The Menagerie" (1966). A significantly redesigned version of Captain Pike's Enterprise appears in Star Trek: Discovery's second season, set several years after the events of "The Cage". The new design for the Enterprise, which more closely matches the aesthetic of Discovery, debuted in 2018 at the conclusion of the season 1 finale. This ship first appears at the conclusion of Star Trek IV: The Voyage Home (1986) and is the main setting in the subsequent Star Trek movies which use the original crew. The ship is ordered decommissioned at the end of Star Trek VI: The Undiscovered Country. Non-canon information concerning this ship includes paperwork included with the model kit, which indicated the ship was mothballed at the Memory Alpha ship museum, and the Shatnerverse novel The Ashes of Eden (1996), which depicted Enterprise-A's removal from the mothball fleet before being destroyed defending the planet Chal. Launched at the start of Star Trek Generations (1994). James T. Kirk is declared missing, presumed killed, after the ship encounters the Nexus energy ribbon on its maiden voyage. Non-canon information concerning this ship includes Star Trek novels listing Demora Sulu (Jacqueline Kim) succeeding Harriman as captain; also, William George, Demora Sulu, and Thomas Johnson, Jr. are listed as the official captains in various licensed guides such as the Haynes Enterprise Manual. This ship appears in the Next Generation episode "Yesterday's Enterprise" (1990). It was destroyed attempting to defend the Klingon outpost Narendra III from Romulan attack. Survivors included Tasha Yar (Denise Crosby), whose alternate timeline version from "Yesterday's Enterprise" travels with the ship back in time to the battle over Narendra III. The actions of the Enterprise-C's crew became a catalyst for the alliance between the Federation and the Klingon Empire. The main setting of Star Trek: The Next Generation (1987–1994). 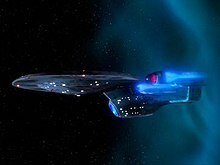 During Star Trek Generations, Enterprise was lost in 2371 after an attack by the Duras sisters' renegade Klingon Bird-of-Prey which caused extensive damage, leading to a warp core breach. Although the saucer section was safely separated before the breach, the shock wave from the exploding engineering hull threw it out of control, and caused it to crash-land beyond recovery on Veridian III. The ship also appears in the first Deep Space Nine episode "Emissary" and the final Enterprise episode "These Are the Voyages..."
The main setting for the films Star Trek: First Contact (1996), Star Trek: Insurrection (1998), and Star Trek Nemesis (2002). As a Sovereign class vessel, it was the most advanced vessel in Starfleet, and an active participant in the Battle of Sector 001 and the Dominion War. In "All Good Things...", the final episode of Star Trek: The Next Generation, Enterprise-D was shown in an alternate future where it had not crashed during the events of Star Trek Generations, and instead had been made Admiral William T. Riker's personal flagship. The ship has a third nacelle (making it capable of at least Warp 13), cloaking ability, a spinal phaser lance, and large phaser cannons on the saucer section. The "Azati Prime" episode of Star Trek: Enterprise involves time travel and features a scene in which Enterprise-J appears. Enterprise-J operates in a possible timeline during the 26th century. In this timeline, Enterprise-J participated in the Battle of Procyon V, a climactic battle in which the Federation successfully drove the invasive trans-dimensional beings known as the Sphere Builders back into their own realm. The ship's crew included a descendant of the Xindi scientist Degra. One version of USS Enterprise (NCC-1701-F) appears in the massively multiplayer online role-playing game Star Trek Online. Its design is based on the entry submitted by Adam Ihle for the 2011 "Design the next Enterprise" contest, a joint venture between Cryptic Studios, CBS, and Intel, which ran shortly before the game went "free to play." Enterprise-F made its first appearance in the mission "Boldly They Rode", at the point where USS Enterprise-F appears to help the player defeat the Dominion fleet surrounding Deep Space Nine. The Mirror Universe first appeared in the original series as an alternate reality where the militaristic Terran Empire exists in place of the regular universe's United Federation of Planets ("Mirror, Mirror"). A montage in the opening credits of the Star Trek: Enterprise episode "In a Mirror, Darkly" shows the Terran Empire logo in use by at least World War II, with licensed novels putting the divergence before Shakespeare, or even classic Greek literature. The Star Trek: Enterprise episode "In a Mirror, Darkly" features a Mirror Universe version of NX-01 Enterprise. This ship is equipped with a cloaking device, deflector shields, a tractor beam, a prototype agony booth, and different exterior markings. It is commanded by Captain Maximilian Forrest, although for a brief time his first officer, Commander Jonathan Archer, takes command following a mutiny. This Enterprise is destroyed by the Tholians. A Mirror Universe Enterprise appears in the original Star Trek episode "Mirror, Mirror". The ship is equipped with an agony booth and the mirror in the captain's quarters conceals Captain Kirk's deadly Tantalus device. ISS Enterprise was originally the same shooting model as the regular Enterprise. The remastered version of "Mirror, Mirror" includes a CGI version of Enterprise with "ISS" markings on the hull and minor physical differences from USS Enterprise, such as a larger deflector dish, a taller bridge, and altered nacelle details. The ship was also shown orbiting the planet in the opposite direction (clockwise instead of counter-clockwise). The 2009 Star Trek film takes place in a new reality created when the Romulan character Nero traveled through time via an artificial black hole. The main setting for the films Star Trek (2009), Star Trek Into Darkness (2013), and Star Trek Beyond (2016). Enterprise is shown during its construction phase at the Riverside Shipyard in Iowa during the first film. A brief shot of the NCC-1701 is seen as the shuttlecraft carrying Kirk and the new recruits into space departs the shipyard later on in the movie. At the end of Star Trek Into Darkness, Enterprise started its five-year mission. The ship was later destroyed by Krall and his alien swarm attack during the events of Star Trek Beyond. Measurements of this ship's length have ranged from 295 meters to 910 meters. In an article about the 2009 film's visual effects, Cinefex wrote, "The reconfigured ship was a larger vessel than previous manifestations – approximately 1,200 feet (370 m) long compared to the 947 foot (289 m) ship of the original series", and quoted Industrial Light & Magic art director Alex Jaeger discussing the design's growth in size during early production of the film: "Once we got the ship built and started putting it in environments it felt too small. The shuttle bay gave us a clear relative scale – shuttlecraft initially appeared much bigger than we had imagined – so we bumped up the Enterprise scale, which gave her a grander feel and allowed us to include more detail." A special feature on starships in the Blu-ray (BD) version of the movie gives the length as 2,379 feet (725 m), which would be larger than the Next Generation D and E versions, making it the largest USS Enterprise in the franchise history (not counting the pre-Federation era Enterprise (XCV 330), seen only as a model). This would result in a height of 167m, and a beam of 339m. Enterprise-A first appears at the end of Star Trek Beyond after the destruction of the original Enterprise when the crew resume their five-year mission. Sean Hargreaves stated that he was given the brief to "beef up the neck and arms" on the Ryan Church design, but went further to give the ship echoes of Matt Jefferies' original design. According to The Star Trek Encyclopedia, the registry number NCC-1701 was devised by Matt Jefferies, art director of the first Star Trek series, inspired by an old science fiction cover that Gene Roddenberry liked, with a starship flying through space. Jefferies, who was a pilot, based NCC on 20th-century aircraft registration codes. In such 20th-century usage, an "N" first letter refers to an aircraft registered in the United States. A "C" for a second letter refers to a civil aircraft. Jefferies added a second "C" because he thought it looked better. The Franz Joseph Blueprints, the book The Making of Star Trek, and a handful of Star Trek novels state that NCC is an initialism for "Naval Construction Contract". In an interview with the BBC, Jefferies explained that NC is the designation for U.S. commercial aircraft and the Soviet Union's space program used the CCCP designation. He concluded that any major future space projects would likely be a combined international effort, thus he invented the combined designation NCC. The 1701 had two functions, it represented the first (01) ship of a 17th federation cruiser design, and that the digits were unlikely to be misread, unlike 6, 8, or 9. In Gene Roddenberry's original Star Trek pitch, the starship is described as a "United Space Ship", and in two episodes of The Original Series (TOS), Kirk refers to the "United Space Ship Enterprise". In 1976, before Star Trek: The Motion Picture, Paramount had planned a Star Trek film to have been named Star Trek: Planet of the Titans. Early in the production, Ralph McQuarrie had been hired to redesign the Enterprise. The major feature of the redesign was to replace the cigar-shaped secondary hull with a larger, triangle-shaped "delta wing" section. McQuarrie's design was discarded in favor of keeping the general shape of the Enterprise intact for the redesign unveiled in Star Trek: The Motion Picture. Three decades later, the McQuarrie design for the Enterprise was adopted as the basis for the design of the USS Discovery in Star Trek: Discovery, a 2017 series that takes place ten years earlier than the original Star Trek. The captain's yacht is a large auxiliary starship built into the design of several Federation starship designs including the Galaxy-class and Sovereign-class. It was docked to the underside of the saucer section. On USS Enterprise-E, the name of the captain's yacht is the Cousteau. In 2375, the crew of USS Enterprise-E used the Cousteau to travel to the surface of the Ba'ku homeworld. Designer Andrew Probert came up with the concept of the captain's yacht while designing the USS Enterprise-D. Although it was never seen in use, it is labeled on the master systems display screen in main engineering, docked at the bottom of the saucer section almost directly opposite the main bridge. Probert suggested possible ways for the yacht to be used during the first season, including not showing the yacht but mentioning it in dialogue, but his ideas were rejected. The producers almost used the yacht in the episode "Samaritan Snare", but decided to use an "executive shuttlecraft" due to budgetary constraints. According to Patrick Stewart, the yacht would have been called the Calypso. Producer Ronald D. Moore noted in the Star Trek: The Next Generation Technical Manual that real-life naval tradition would insist on calling such a craft the captain's gig, rather than the captain's yacht. Rick Sternbach later designed similar craft for USS Voyager and USS Equinox, known as the aeroshuttle and the waverider, respectively. As on the Enterprise-D, however, these vessels were only depicted on technical schematics and never seen in operation or referred to in dialog. In 1976, as the result of a successful letter writing campaign by fans, NASA named the initial flight-test Space Shuttle Enterprise. For three days in October 1994, the real aircraft carrier USS Enterprise (CVN-65) hosted half-hour tours for thousands of fans attending a Star Trek convention in Norfolk, Virginia, and Star Trek memorabilia could be found throughout the ship. In 2014, NASA named its IXS Enterprise advanced propulsion concept vehicle after the Star Trek vessel. Celebrity astrophysicist Neil deGrasse Tyson has spoken highly of the influence and legacy of the original Enterprise on other fictional spaceships. Drawing a parallel to comparing athletes between eras, he said of spaceship design, "What matters is not what they look like now, but what they looked to others at the time that they prevailed... There is only one spaceship that's earlier than [the original Enterprise], and that's the flying saucer from The Day the Earth Stood Still. So, what matters here is, what did [the Enterprise] look like at the time it came out (1966) compared with anything that had been imagined before? And when you consider that, that is the most astonishing machine that has ever graced the screen." On the ship's influence upon scientists, Tyson wrote, "The Enterprise was the first ever spaceship represented in storytelling that was not designed to go from one place to another; [it was] only designed to explore. It was revolutionary in terms of what we would think space would, and should, be about." NetDragon Websoft, a gaming and mobile Internet company in Fuzhou, China, based the architectural design of its headquarters building on the Next Generation-era Enterprise (primarily the Enterprise-E), under an official license from CBS. ^ a b Goldstein, Stan; Fred Goldstein; Rick Sternbach (1980). Star Trek, Spaceflight Chronology: The Human Adventure Beyond Our World—from the First Small Steps to the Voyage of the New U.S.S. Enterprise in the Twenty-Third Century. New York: Pocket Books. p. 112. ^ Sackett, Susan; Roddenberry, Gene (1980). The Making of Star Trek: The Motion Picture. Pocket Books. p. 93. ISBN 978-0-671-25181-9. ^ a b c d e f Asherman, Allan (1993). The Star Trek Compendium. Titan. ISBN 978-1-85286-472-9. Jason Zimmerman: It starts with them giving us designs to work with and then there is a lot of back and forth between VFX and [Tamra's] department to make sure that we get everything right. There were a lot of conversations and more emails than I could remember about how the design would evolve and sort of match our universe, and that is how we sort of arrived where we are now. 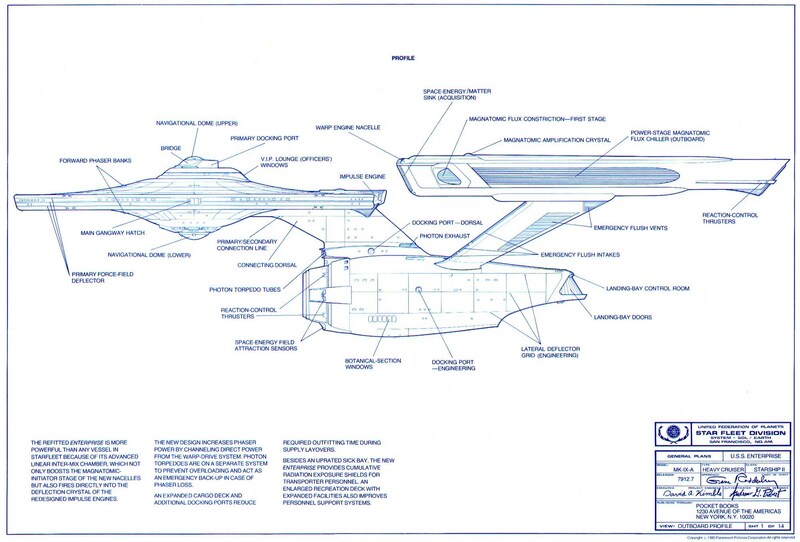 ^ "Star Trek: The Motion Picture Official Blueprints". CBS Paramount. p. 1. Archived from the original on February 6, 2007. The refitted Enterprise is more powerful than any vessel in Starfleet because of its linear inter-mix chamber, which not only boosts the magnatomic-initiator stage of the new nacelles, but also fires directly into the deflection crystal of the new nacelles. 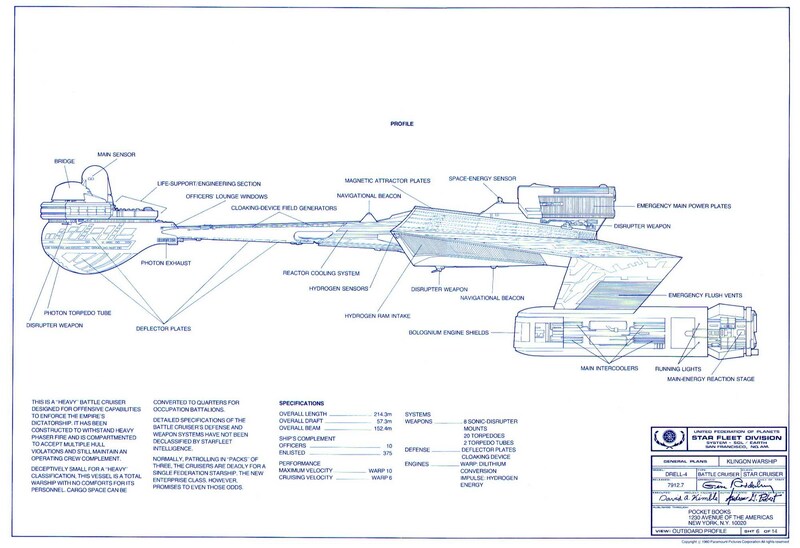 ^ "Star Trek: The Motion Picture Official Blueprints". CBS Paramount. p. 6. Archived from the original on February 6, 2007. Normally patrolling in 'packs' of three, the cruisers are deadly for a single Federation starship. The new Enterprise class, however, promises to even those odds. ^ a b c d e f g h i Okuda, Michael; Denise Okuda; Debbie Mirek (1999). The Star Trek Encyclopedia. Pocket Books. ISBN 0-671-53609-5. ^ Bick, Ilsa J. (November 2003). Star Trek: The Lost Era: Well of Souls. Pocket Books. ISBN 0-7434-6375-7. ^ Sternbach, Rick (November 16, 2006). "Review of Mirror Mirror Remastered". TrekMovie.com. 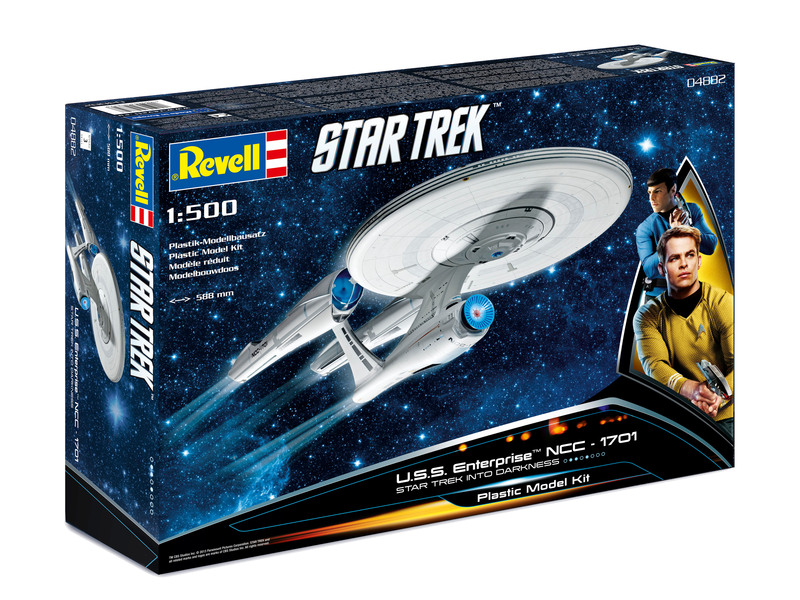 ^ Revell GmbH (2013). "U.S.S. Enterprise NCC-1701 – Star Trek Into Darkness". Revell – Build Your Dream (image of model kit box). Bünde, Germany. Archived from the original on September 6, 2018. Retrieved September 6, 2018. ^ McGorry, Ken (May 1, 2009). "Cover Story: 'Star Trek' Returns". Post magazine. The Enterprise is 3,000 feet (910 m) long but bad guy Eric Bana's ship is designed to appear a humongous five miles long. Quote from Russell Earl, co-VFX supervisor for ILM. ^ Robertson, Barbara (May 13, 2009). "Reinventing Star Trek's VFX". Film & Video. The Narada was six miles long and the Enterprise is 2,000 feet (610 m). Quote from Bruce Holcomb, Digital Model Supervisor for Star Trek. ^ Dunlop, Renee (May 26, 2009). "Star Trek: Production Focus". CCGSociety. Archived from the original on May 29, 2009. Retrieved June 12, 2009. One challenge was to sell the weight and scale of the ships that ranged from a 30 foot shuttle to the new Enterprise at 2,357 feet (718 m) long, to the nemesis ship, the Narada, five miles long. Source: Russell Earl & Roger Guyett, co-VFX Supervisors at ILM. ^ "Experience the Enterprise". Paramount Pictures & CBS Studios Inc. Length: 2,500 feet (760 m). ^ a b Fordham, Joe (July 2009). "Star Trek: A New Enterprise". Cinefex (118). ^ "BBC Online - Cult - Star Trek - Matt Jefferies - Why NCC-1701?". Bbc.co.uk. Retrieved August 21, 2013. ^ Collura, Scott (August 11, 2016). "Star Trek: Discovery's Ship Design Still Evolving". IGN. San Francisco: IGN Entertainment Inc. Archived from the original on August 12, 2016. Retrieved October 17, 2016. ^ a b c Sternbach, Rick; Okuda, Michael (1991). Star Trek: The Next Generation Technical Manual. Simon and Schuster. p. 145. ISBN 978-1-4391-0856-7. ^ Conway, Richard (May 16, 2013). "Star Trek, Before Darkness: 47 Years of Starship Designs". Time. ISSN 0040-781X. Archived from the original on September 27, 2016. ^ Dumoulin, Jim, ed. (March 18, 1994). "Enterprise (OV-101)". Kennedy Space Center. NASA. Archived from the original on August 18, 2018. ^ McKinnon, Mika (July 10, 2014). "Declassified Memos Debate Naming the Shuttle Enterprise". Gizmodo. Archived from the original on August 19, 2018. ^ Navaroli, Randy (February 1995). "Starship Enterprise comes alive aboard namesake" (PDF). All Hands. Washington, D.C.: Naval Media Center (934): 20. Archived (PDF) from the original on June 1, 2017. Retrieved August 19, 2018. ^ Joyce, Dennis (October 28, 1994). "Carrier Enterprise Meets Starships Enterprise: Star Trek Fans Plan to Boldly Go Aboard the Navy Ship for Convention Tour". The Virginian-Pilot. Archived from the original on August 19, 2018. Retrieved August 19, 2018. ^ Phillips, Chaka (June 22, 2014). "Warp Speed Tests: NASA Advanced Propulsion Names Latest Model Enterprise After Star Trek". Latin Post. Archived from the original on August 20, 2018. ^ Plumbline Pictures (July 16, 2012). "Neil deGrasse Tyson at the Starship Smackdown, Comic-Con 2012". YouTube. Retrieved August 17, 2018. ^ National Geographic (November 27, 2015). Millennium Falcon or Starship Enterprise? - Fan Question. StarTalk. YouTube. Retrieved August 17, 2018. ^ Pachal, Pete (May 19, 2015). "Make it so: Chinese building looks just like Star Trek's USS Enterprise". Mashable. Archived from the original on December 19, 2017. Retrieved September 18, 2017.